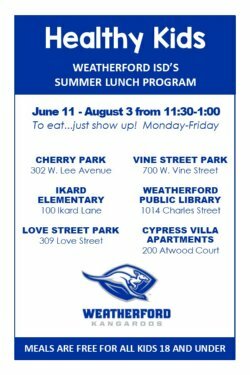 Weatherford ISD's Healthy Kids summer lunch program kicks off on Monday, June 11th. The program offers free lunches to all area children who are 18 years old and younger. Healthy Kids will run Monday - Friday thru August 3rd. Meals include hot baked entrees such as popcorn chicken, chicken nuggets, and sandwiches - along with fresh fruits and vegetables. Funded through a Texas Department of Agriculture program, the meals are prepared and served by Weatherford ISD’s Child Nutrition department and meet all federal and state nutrition guidelines. For more information, please contact the Weatherford ISD Child Nutrition department at 817-598-2991.